Vixen's Daily Reads: Kelley Armstrong is Guest Blogging over at Amberkatze's! Kelley Armstrong is Guest Blogging over at Amberkatze's! Oh boy, oh boy, oh boy!! 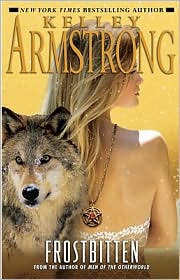 Kelley Armstrong is guest blogging over at Amberkatze's blog today! There's a chance to win a copy of the latest Women of the Otherworld series, FROSTBITTEN, too. Get on over there and have a chance to win and read the cool blog post.